Beautiful doesn't begin to describe this relaxing spa room! The installation is in a 20' x 22' indoor spa area. 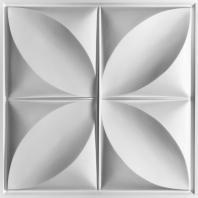 I used 24" x 24" white Ceilume Petal Ceiling Tiles and HG-Grid Vinyl Suspension System from Acoustic Ceiling Products. For the edge pieces, I used painted drywall. I selected Ceilume tiles and the HG-Grid system because of the humidity in the spa area. The grid system was slightly more difficult to install than a metal system since the pieces did not snap together as easily as metal and the plastic was much more flexible and harder to keep in place. The tiles dropped right in without a problem. The only problem I had was that I did not realize that the Petal tiles are directional so I had completed a section before noticing that the tiles should be oriented in a specific pattern.